The mosaics created are an interpretation of the original buildings or significant events from their history. The size of each mosaic was chosen to enable their placement as near as possible to the original sites. Different tiles (tessarae) have been used to reflect the period and subject of each building. The Empire Music Hall mosaic is a depiction of Marie Lloyd who famously gave her last performance there. The Regal Edmonton is a depiction of the original opening brochure in full 1920s glamour. The Alcazar shows sections of the building highlighting the Moorish Architecture and the ironwork of the period. The Queen’s Hall highlights the original building with its fantastic domed entrance. The Premier shows iconic film stars from its heyday. The Edmonton Theatre, The Bycullah Atheneaum and The Coronation are reproductions of the original façades taken directly from photographs. 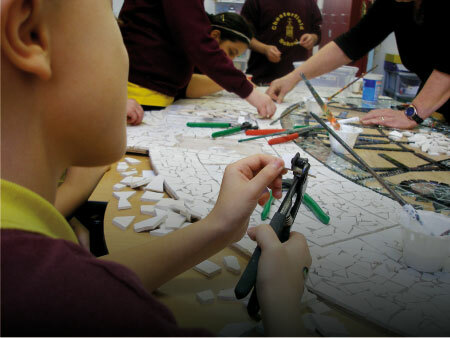 Two of the mosaics were created as special community projects. The Bycullah Atheneaum and Coronation were created with support from children and adults resident in Southgate and Enfield. The designs have been reproduced from photographs sourced from the internet, Enfield Local Studies Unit and the book ‘Theatres, Music Halls and Cinemas in the London Borough of Enfield’ by Geoffrey Gillam.